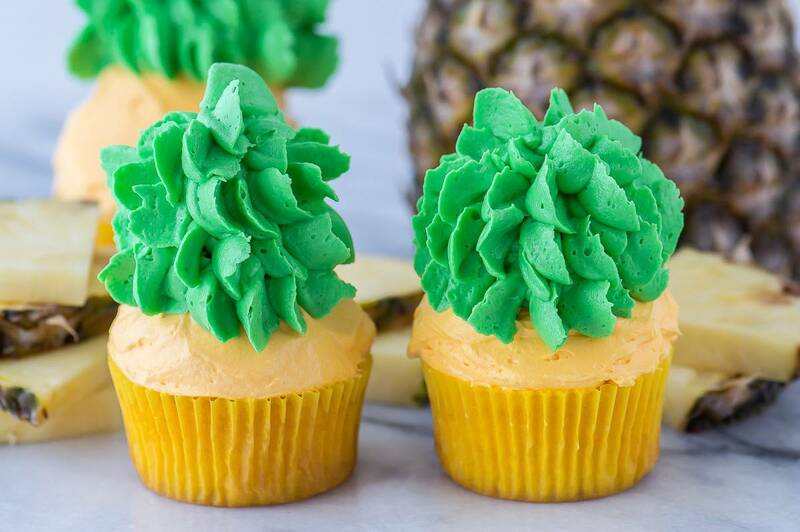 Pineapple cupcakes – cupcakes that look like PINEAPPLES! The buttercream tastes like pineapple too! 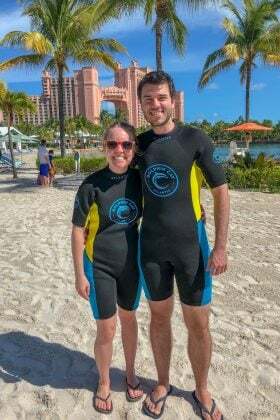 I’m not sure where the pineapple craze came from, but I love seeing all things pineapple! There’s all the normal pineapple stuff like pineapples on t-shirts, mugs, iPhone cases but I found some extra fun pineapple things.. pineapple pool floatie, a fancy pineapple cutting board, pineapple earbuds (!!!!!) and a pineapple shaped sleeping bag! I actually own zero pineapple things, except for the occasional real pineapple. 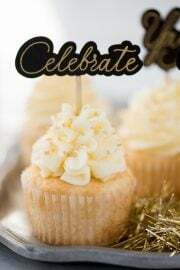 But my love for all things pineapple inspired these pineapple buttercream cupcakes! A few weeks ago I shared a recipe for watermelon cupcakes – the frosting tastes like watermelon and they look like cute little watermelons! 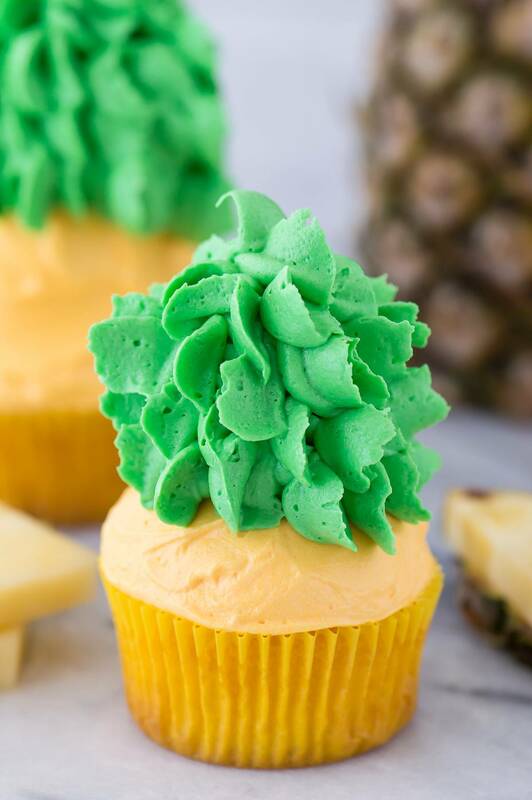 Those fun cupcakes inspired me to see if I could make cupcakes that looked like pineapples. 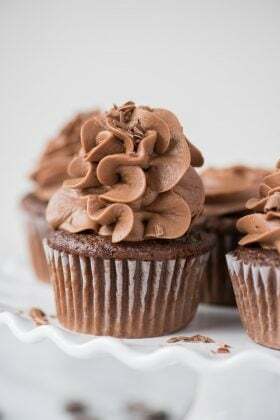 The leaves took a little practice but I boiled these cupcakes down to a few steps so you will definitely be able to recreate them in your kitchen! 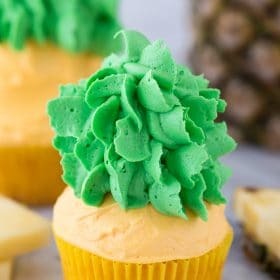 To make pineapple cupcakes you’ll need..
Not only do these cupcakes look like pineapples – the buttercream tastes like pineapple!! 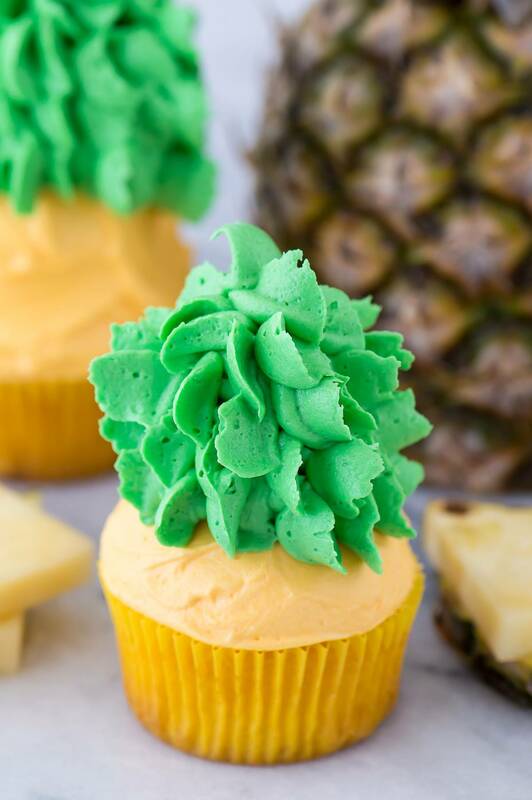 Just like in our watermelon cupcake recipe, we used kool aid powder (the pina pineapple flavor) to achieve pineapple flavored buttercream. 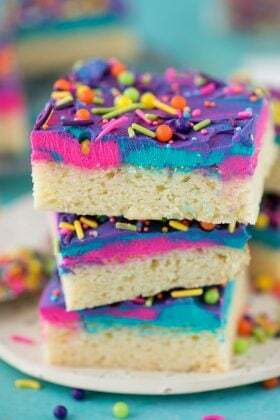 In a recipe like this where the buttercream is crucial to the decoration, you want to make sure you have more then enough. There is nothing worse than running out of buttercream after you’ve already dyed it because getting the same color buttercream is challenging! 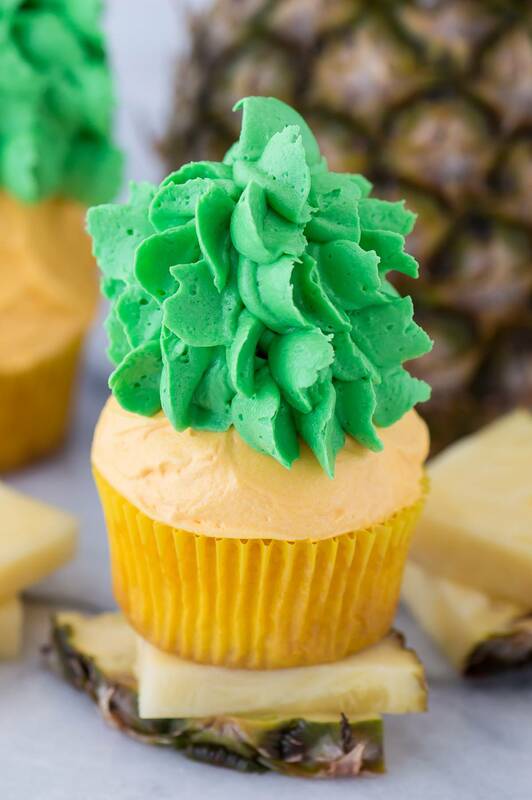 And this recipe does require a lot of buttercream – that’s where the pineapple comes to live! This is a great collage to reference when you are decorating the cupcakes. Written directions are below in the recipe section. 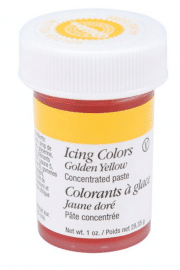 Add in the yellow food coloring, mix to incorporate. Divide the batter among the yellow cupcake liners, filling each 1/2 full. In a mixing, bowl beat the butter and vegetable shortening with an electric mixer until smooth, about 4 minutes. Add in 3 cups of powdered sugar, mix by hand with a spatula. 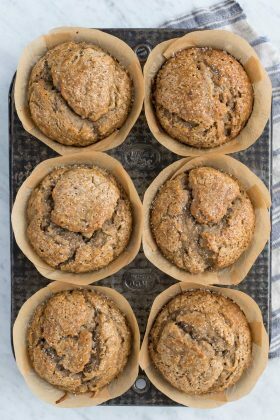 Add in more powdered sugar as you see fit, up to 6 more cups if needed (add 1 cup at a time), mixing first by hand then with an electric mixer. 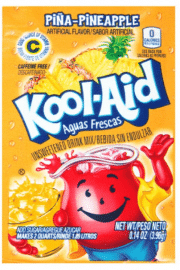 Add in the pina pineapple kool aid powder, mix to combine. 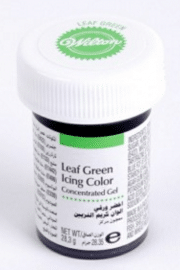 Divide the buttercream into 2 bowls - one will by dyed yellow and one will be dyed green. Add the appriopate food coloring to each bowl, mixing one last time with an electric mixer until the color is incorporated. Using a large cookie scoop, scoop up yellow buttercream. 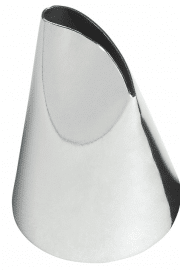 The cookie scoop should be full of frosting, but level the frosting and remove any excess the overfills the scoop. Use the release on the scoop, release the buttercream onto a cupcake. Use a small metal spatula to smooth the buttercream onto the cupcake, having the buttercream meet the edge of the cupcake liner. 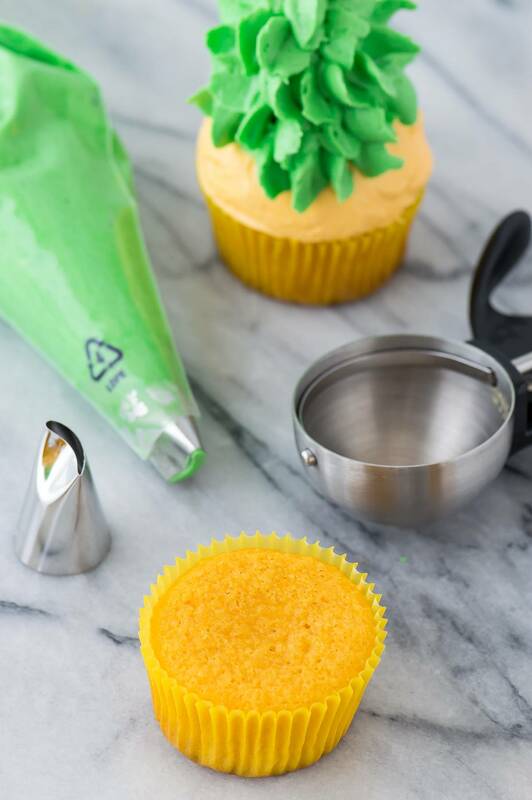 Fill a piping bag set with a wilton #123 tip with green buttercream. 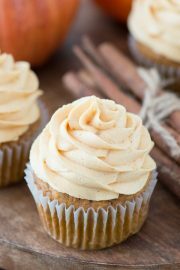 Squeeze the piping bag, adding a good sized dollop of buttercream to the center of the cupcake. This is the base of the leaves from which we will build off from. Begin to add the leaves, starting at the base of the dollop you just made. To do so place the buttercream tip against the dollop, squeeze as you pull the piping bag away. You want to make these spiky looking leaves. Continue adding leaves until the entire dollop is covered. Best served the same day that you add the buttercream.